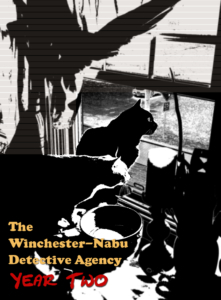 AMBER LOVE 08-APR-2019 Catch up on Year One and previous Year Two cases at the Winchester-Nabu Detective Agency. 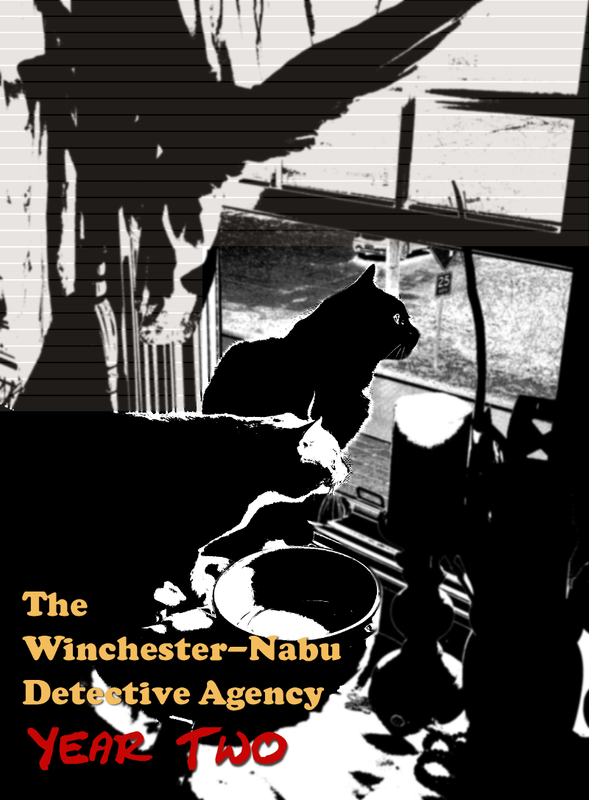 This work is supported by the generous backers who adore my cat stories at Patreon.com/amberunmasked and they also get first access to whatâs happening with my books and podcast. For a one-time tip, you can go to the new PayPal.me. 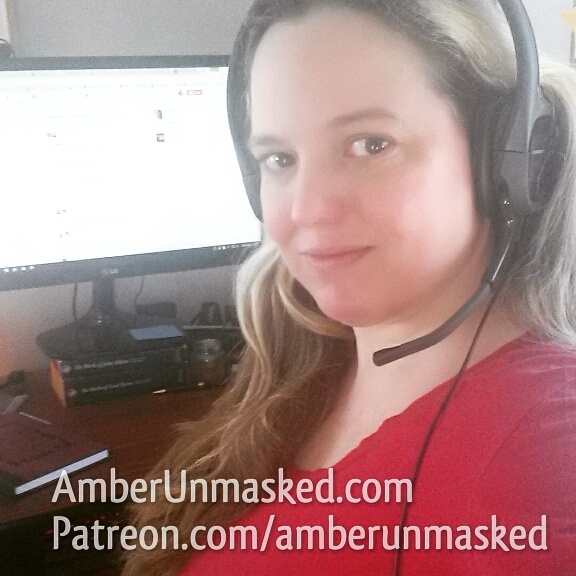 Also, I’m an Amazon Influencer so you can shop through my personal recommendations on cat things, writing guides, books, and wellness supplies. We had to go to an expert on dead things for analysis about clumps of hair discovered on the ground. Is the title another Parker reference? Yes. Yes it is. Even though I’ve primarily referenced the Parker of Leverage fame, Richard Stark’s Parker is another great thief. That’s why word got around that our most cunning, most daring, most successful backyard thief uses the same moniker. 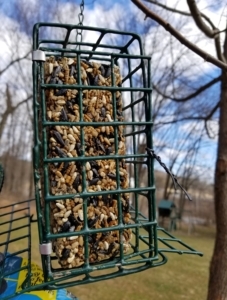 After entire brick of birdseed went missing from the cage style feeder, we had to do something so the birds would come to the backyard where we wanted them. On Gus’ Adoptiversary Day, (also St. Gertrude, patron saint of cats day and that guy you may have heard of, St. Patrick), we took one of our adventures. The birdseed brick had gone missing again! The ground was soggy from melting snow. Gus stepped carefully trying to avoid squashing his feet into mud. We were thankful that the weather was nice enough to have time outside. Spring is an awkward season of freezing and snow with bright sunny days reaching seventy degrees. If you’re wondering how we could pin all this thievery on one particular squirrel, it’s because signs point to Parker. Even a Magic 8 ball would say so. Parker has style and skills better than others of her kind. Even if Eliot is faster, Parker has better acrobatics. There are videos and photos of the team working together in Case File No. 42-94. 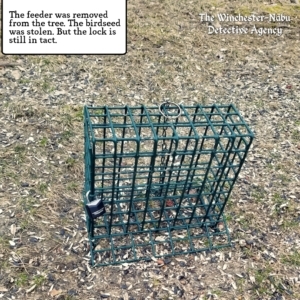 First, we had to address the situation of the empty bird feeder. Fortunately, the butler Alfredo Pesosvalor, had thought to pick up some bricks of birdseed while he was out so we had a backup. 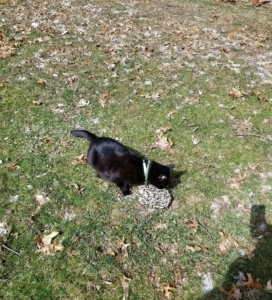 I was able to leave Gus in the yard while I walked back and retrieved the new brick. I brought along a twist tie to secure the door of the feeder hoping that would do the job to keep Parker from taking more than her share. 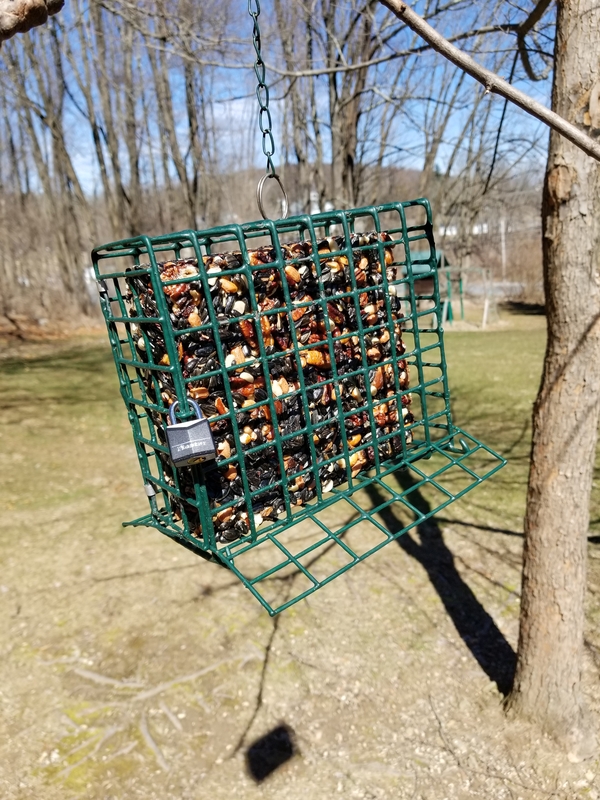 A replacement brick of birdseed was installed with a twist tie to lock it. After that part was done, I caught up with Gus on the north end. I found him hunched over something. I thought for sure he must have caught a rodent. My Timberland shoes squished as I walked over the swampy part. 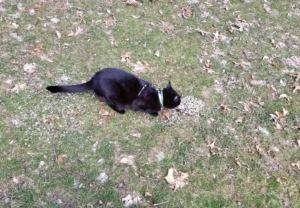 I reached Gus at the edge of the property line and found him on a spread of birdseed. 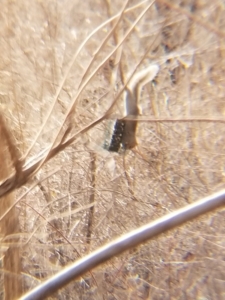 Well it was no wonder I saw the smaller songbirds landing over there. What was left of the missing birdseed brick was there. Parker must have realized it was too heavy for one squirrel to carry alone. She dropped the stash and left the crime scene. Meanwhile, Gus was not dusting for pawprints. Nope. I caught him eating the evidence! By now you’ve gotten to know Gus’ personality and he almost never resists temptations of any kind. It was probably a healthy snack but I’ve never had a cat eat seeds before. Caico would eat some funny things like corn on the cob and acorn squash, but I don’t think she ever had the opportunity to try seeds. Gus decided to eat the birdseed. 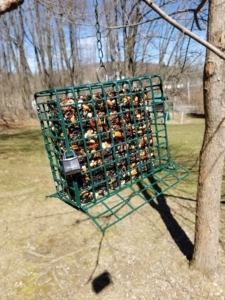 None of the security cameras point at the maple tree where the feeder hangs. 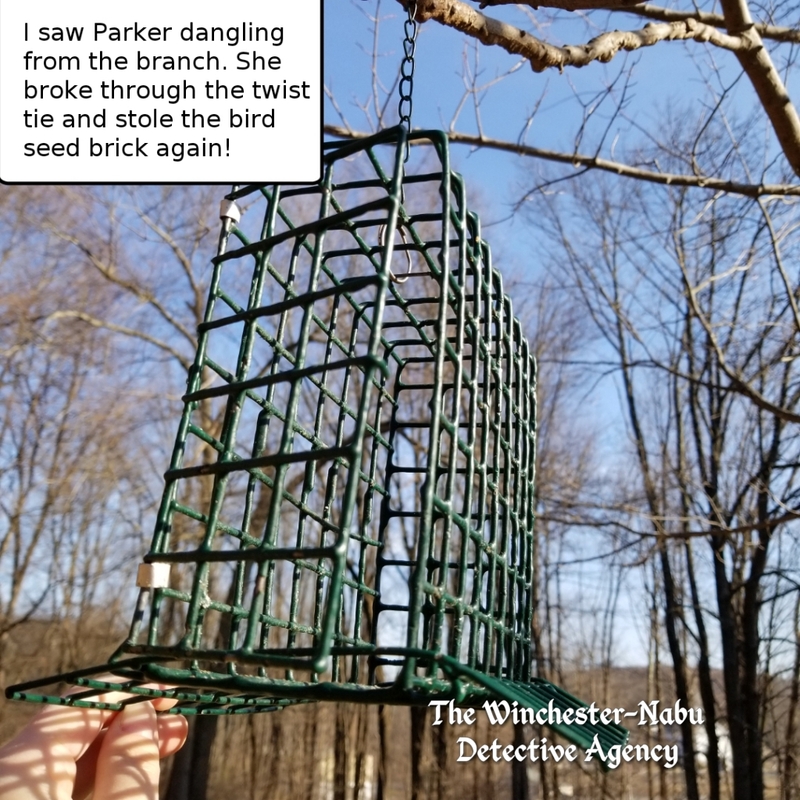 I’m curious to know if Parker tried this rather epic feat by herself or if any of the other Leverage squirrels joined her. Since the almost completely in tact birdseed brick was found, I’m inclined to believe she was acting alone. Accomplices could have helped break it into smaller pieces and each carry some of it away. 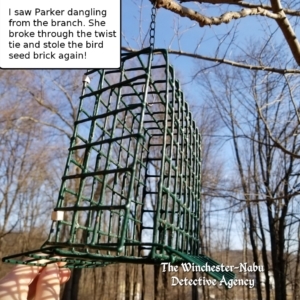 Our theory is that Parker calculated the height of the drop with gravity and the estimated weight of the remaining birdseed coming to the conclusion that the fall would have broken it into pieces. Unfortunately for her, the height was not high enough. Cut to a few days later. Imagine my surprise when I looked out from the observation deck with my binoculars to find the cage empty again after another refill. 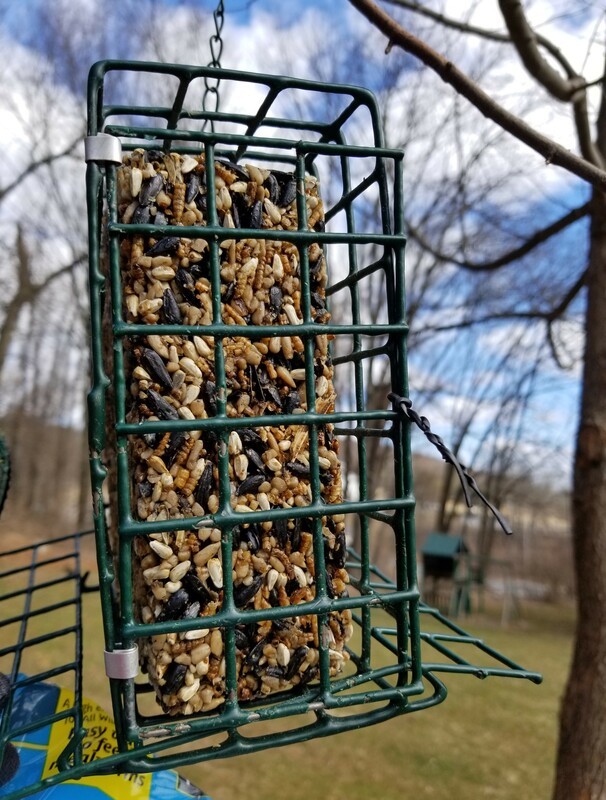 Parker managed to easily remove the twist tie and tried again to abscond with the birdseed. This time she left it under the bird feeder at the maple tree. Where are Parker’s teammates? Why does she have to do all this work alone? But more importantly, how can we stop her from stealing from the bird community? We would like all of them to coexist in harmony. Prong #1: Alfredo Pesosvalor picked up a heavy bag of mix labeled “squirrel feed” which contains a lot of corn. We haven’t tried putting it out yet, but with any luck that part of the two-pronged “meat-fork” solution will show Parker and her friends that we welcome them just as we have the Chipmunk Mafia. Prong #2: We knew there was no point in trying to twist tie the cage door closed again. It’s now gotten severe. This calls for something impenetrable. This job calls for Master Lock™. 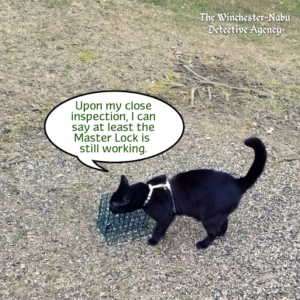 After only a day and a half with the Master Lock™ on the bird feeder, evidence of Parker’s tampering was found again. It was Monday morning. Gus had been crying for twenty minutes already to get me out of bed to go for a walk. I rolled out of my warm and comfortable cocoon of blankets and reached for my slippers. We walked to the balcony door and I escorted him out to the observation deck. I admit it was quite chilly in my pajamas. Gus being Gus, ran back to the door after approximately forty-five seconds. I followed him inside where he immediately made a U-turn and wanted to go back out. I grabbed my sport binocs off the shelf and opened the door. He was occupied by something, I don’t know what. I looked out across the open yard and found the bird feeder on the ground with the birdseed brick still inside. It seems that if Parker can’t crack a lock, she’ll steal the whole safe and try to break in later.